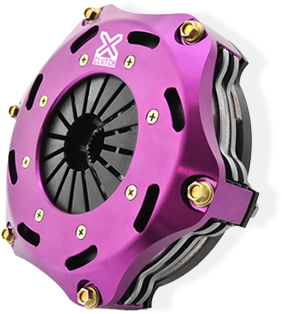 These XClutch range of twin disc organic clutch kits are the ideal performance upgrade for high horsepower street vehicles. These kits are popular in supercharged or turbocharged high capacity motors that are still operated on the street. The kits often include a variety of upgrade components such as hydraulics and braided lines to improve driveability and durability. With a strap driven cover rather than a conventional floating intermediate plate, these kits offer silent type operation rather than the common "twin disc rattle" found in most multiplate kits.